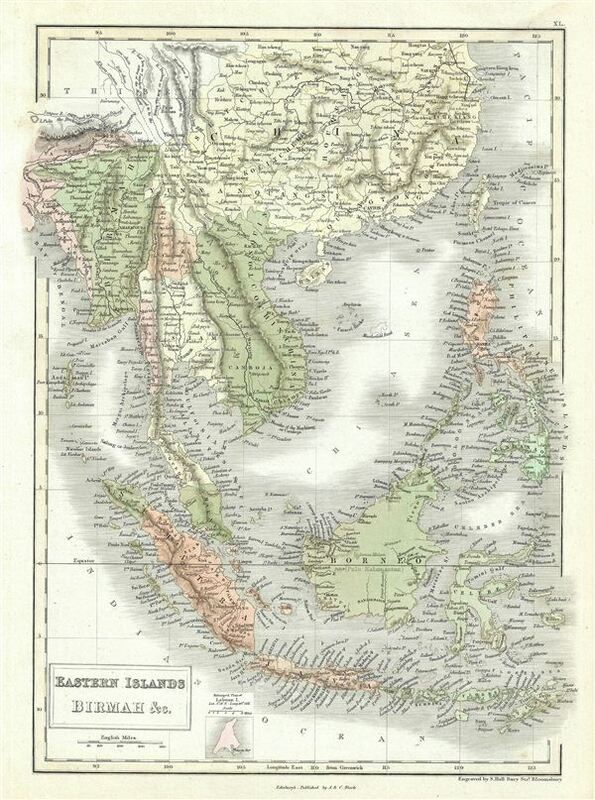 This is a fine example of Adam and Charles Black's 1851 map of the east Indies, Southeast Asia, and the Philippines. Includes modern day nations of Singapore, Myanmar (Burma), Laos, Vietnam, Cambodia, Thailand, Malaysia, Indonesia, the Philippines and parts of China. During this time in history, Burma was under British rule, while much of modern day Indonesia including Sumatra and parts of Borneo were part of the Dutch colony of the Dutch east Indies. The French dominated Indochina, including Cambodia and Vietnam and most of the modern day Philippines were a Spanish territory called Spanish east Indies. Only Thailand (Siam) and China retained national sovereignty. Various cities, towns, rivers, mountains, islands and several other topographical details are noted with relief shown in hachures. This map was engraved by Sidney Hall and issued as plate no. XL in the 1851 edition of Black's General Atlas of the World.